Flexibility, brightness, low maintenance, energy savings, great style, and a commitment to a safer environment – these are some of the benefits you’ll get from LED lighting products. With a lifespan nearly 50 times that of incandescent bulbs, LED technology makes for an energy-efficient investment for which you’ll see your maximum ROI in no time! So many of our clients are shocked to discover that their lighting constitutes from 30 to 50 percent of their electric costs each month. LED lighting costs are falling, and with high efficiency options to choose from and incredible incentives for upgrading to LED lighting, now is the time to install or upgrade your parking lot lighting to LED lighting solutions. Visibility and security are important factors when considering what kind of lighting you want to install in your outdoor spaces, whether they’re commercial parking lots or private residences requiring significant lighting. MMJ Electric’s security lighting, parking lot lighting, and wall packs provide maximum light output where and when you need it most. 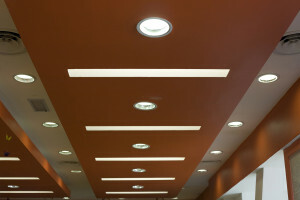 We can help you design accent lighting that invites customers safely into your space and can become part of your brand. MMJ Electric is a full-service lighting contractor, so we work with builders, architects, and designers to select the perfect outdoor lighting fixtures to meet project requirements, light code requirements, and ordinances. At MMJ, we only install, design, and maintain – from installing the pole to the light fixture – the highest quality LED lighting products to provide the best value to you. We handle the entire process, from permit to installation to inspection. You can be assured you have a single, professional contact for all your needs without the hassle that comes from having a subcontractor. The standard by which we do business leaves no room for compromise. At MMJ Electric, we believe that doing the right thing every time, all the time, even when no one is looking is the best way to do business. 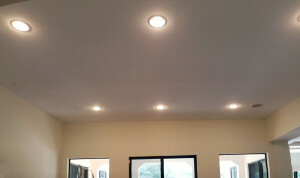 Contact us today for more information on how MMJ Electric, your LED lighting specialist, can help you.